Fascination with Kafka’s writing stems from its inexhaustibility. All Kafka’s writing including much of his diaries, letters and the aphorisms can sustain a multiplicity of interpretation. Of all Kafka’s stories, Metamorphosis will keep readers and critics guessing and interpreting as long as literate people survive. Every age will have its own Metamorphosis. A psychological interpretation: of course; a Marxist reading: how many do you want? gender-based analysis: sure; feminist criticism: see Nina Pelikan Straus’s brilliant essay. Kafka, by his own admission, wrote better short stories than Metamorphosis, writing that the story originated “during my misery in bed and oppresses me with inmost intensity”. The ending, in particular, disappointed Kafka. I adore the ending, one of the coldest and most disturbing endings I have read. Endings nearly always disappoint me. This is an exception. I suspect that the appeal of The Metamorphosis is that the story expresses the hopeless sense of alienation and loneliness common to us all. Though The Metamorphosis is not my favourite Kafka story I read it yearly, two or three times. With Sartre’s Nausea it is an annual ritual. Kafka’s form is the short story, more so the aphorism. His impossibly high standards impeded him from finishing any of his longer fictions. Most Kafka stories including The Metamorphosis can be considered incomplete. Nina Pelikan Straus’s Transforming Franz Kafka’s Metamorphosis is a favourite piece of Kafka criticism, offering a highly convincing feminist reading. Straus argues that Metamorphosis reveals the plight of “one who is caught between the shameful desire to identify himself with women and the consciousness that he cannot identify himself with men”. In her essay, Straus argues it is Grete’s as much as Gregor Samsa’s transformation at the heart of the story. The important picture that Samsa treasures, “a lady done up in a fur hat and a fur boa, sitting upright and raising up against the viewer a heavy fur muff in which her whole forearm had disappeared”, has yielded a myriad of psychological interpretations. 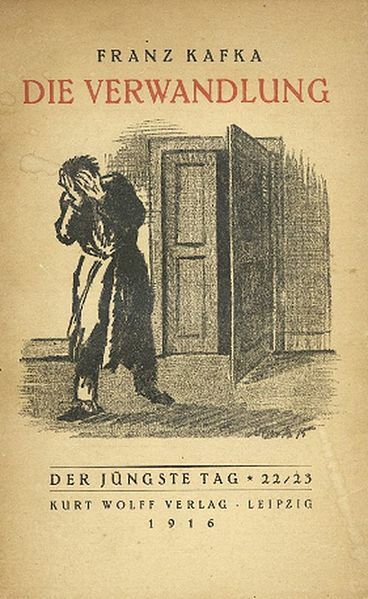 The character in the picture was based on a book, widely popular at the time, and a favourite of Kafka and his cronies. The book, Venus in Furs, was written by Leopold von Sacher-Masoch, from who’s name the term masochism is derived. Unfortunately Leopold von Sacher-Masoch never met Marquis de Sade, the latter died before Sacher-Masoch was born. This entry was posted in Franz Kafka, Jean-Paul Sartre, Leopold von Sacher-Masoch, Marquis de Sade, Nina Pelikan Straus by Anthony. Bookmark the permalink. Nice post, Anthony. I’ve been reading Kafka’s Diaries (bit by bit, randomly) over the past few weeks and it’s fascinating to see how often he would revise and refine and reimagine a circumstance or idea that would eventually end up as one of his parables or shorties or aphorisms. I love the ending of Metamorphosis too, but I’ve never thought of it as cold at all—the casting out of the lodgers, and the final image of the sister stretching her young body in the sunlight seem triumphant (if purchased at the expense of GS’s death). I think this is why Kafka endures—the range of readings it invites. I’m fascinated by the way Kafka shaped and reworked his texts, experimenting with ideas in the diaries and letters, and distilling essences down into the aphorisms. The chill I get at the close of Metamorphosis is of the bright, optimistic ending coming so soon after G’s death. It is beautifully callous how completely the son becomes the Other, and so makes possible the transformation of the Grete, and in a way, the mother and father too. Very creative. Talking of parodies there is also this: http://www.guardian.co.uk/books/2011/may/04/kafka-metamorphosis-meowmorphosis – which sounds truly horrific. Yep, I’ve seen this one – another turn in the grave from Mr. K (at least I didn’t expect people to pay for my effort…).